Bob’s Machine Shop’s Versa Jac manual jack plates offer new technology in the Jack Plate market. The first & only jack plate to offer a upgrade kit to change a manual jack plate to hydraulic at a later date! 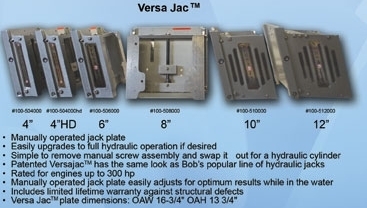 Bob’s Machine Shop’s Versa Jac jack plate line, offers new technology in the Jack Plate market. The first & only jack plate to offer an upgrade kit for boaters to convert to Hydraulic at a later date! Made of high-quality, aircraft-grade aluminum, the patent pending Versajac™ has the same look as Bob’s popular line of hydraulic jacks. It is rated for engines up to 300 hp and is available in 4″, 6″, 8″, 10″, 12″ & 14″ setbacks as well as our mini jack plate line. Adjusting the jackplate for optimum results is easily done while the boat is in the water. When it’s time to upgrade from manual to all-hydraulic operation, converting the jack is simple. Using a few basic hand tools, remove the Versajac’s manual screw assembly and swap it out for the new hydraulic cylinder kit. Then install the pump inside the boat. All BMS’s hydraulic pumps are designed to mount inside for longevity and protection from the elements. Jack plates have “limited lifetime warranty” and pumps have a 5 year warranty (excluding water damage). Bob’s Versa Jac, Jack plates offer 1 piece design, unlike competitors that require setback spacers to achieve the proper setback.